Heather Richard is a US Coast Guard licensed (100 ton) captain for hire on San Francisco Bay. Interested in classic schooners or racing catamarans? Teak or carbon fiber? A gentle cruise or a rip-roaring ride? Learn to sail lessons or private coaching? America's Cup spectating, sightseeing, whalewatching, crabbing or sipping wine on the Bay... Captain Heather can find you the right boat and the right experience. 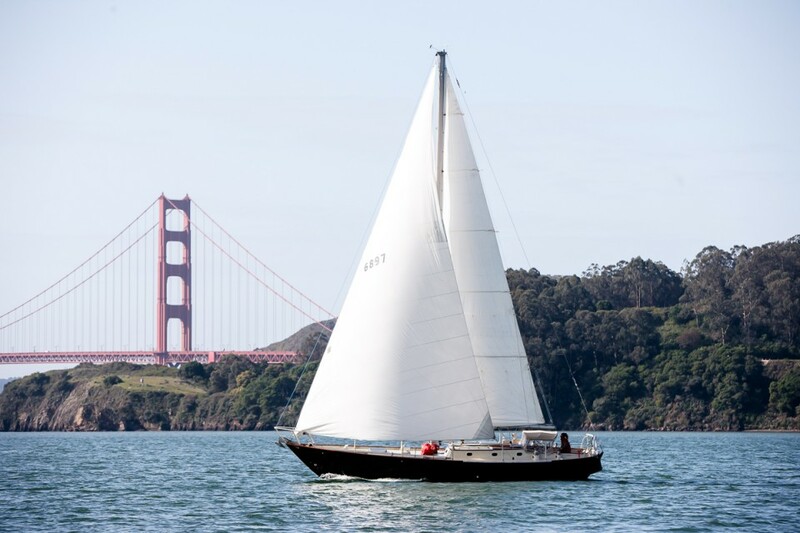 Almost every day is a fine day for sailing on San Francisco Bay, so call or email to discuss the possibilities! Heather grew up on the East Coast and has been sailing since the age of 4. She raced competetively on the Boston University team while earning a BFA in sculpture, and worked on charter boats and in community boating programs in Boston. She also worked for the US Navy in Japan, Sail Carribean Voyages and the Saint Francis Yacht Club coaching young sailors. She currently lives aboard with her three children in a maritime co-op. In the off season she can be found in her art studio and is active in her community volunteeering with youth programs and bringing waterfront access to underserved populations. She is working with a group of volunteers to start Sausalito's first community boating program at Cass Gidley Marina. Www.cassgidley.org For the 2013 sailing season Heather was captain of the Schooner "Gas Light", in 2014 she added her own vessel "Carodon" to the charter fleet as well as sailing with the America's Cup Yacht USA 76 and Prosail 40 catamaran "Tomcat". She is able to book your ideal sailing experience on a variety of sailing vessels up to 50 passengers and also offers private coaching. This year we volunteered as a support boat for some amazing swimmers to raise money for Baykeeper. Baykeeper watches over our waters and works hard to prevent pollution so we think it's a great cause to support and I look forward to doing some more on the water volunteering with them this winter. Check out… Continue reading Baykeeper Parade success! Scow schooners are near and dear to my heart and none more so than the Alma... come to Maritime Day next Saturday august 5th and see her up close at our dock, listen to some rockin waterfront music, eat fish and chips, see boatbuilding demonstrations and take a free boat ride on Carodon! Whales are popping up everywhere this season and we're loving it! We also love our new solar panels you can see above (thanks dad!) and we haven't plugged back into the grid once since we installed them! How to plan a sailboat elopement – 100 Layer Cake published this so we thought we’d share it with you!